August 15, 2016 – This week, we follow the journey of the men and women who — in the aftermath of World War Two in Europe — dedicated themselves to visiting justice upon Hitler’s Henchmen. 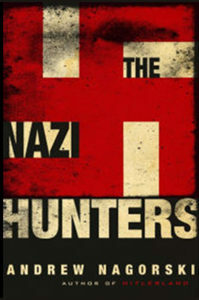 Veteran author and foreign correspondent Andrew Nagorski brings us these stories in The Nazi Hunters , stripping away the myths and caricatures of popular fiction. The book is also an implicit call to action, breathing life into the phrase “Never Again,” as the last cogs of the National Socialist Party’s bloody legacy, rust away. You can read his latest articles at AndrewNagorski.com, and check out his previous books. Those include the companion to today’s title, Hitlerland: American Eyewitnesses to the Nazi Rise to Power . You can also follow our guest on Twitter @AndrewNagorski, or like his Facebook page. We also mention the documentary film, Hitler’s Children, which you can check for a look into the legacy of those descended from the Third Reich’s war criminals.